Smart TVs always do their best to give users the best video watching experience at home. That's why people would like to watch movies on smart TVs. For average online streaming movies or local videos, there is no problem to play them online. But when comes to iTunes movies, things go different. You will found that you're not allowed to play iTunes movies on TV sometimes. This iTunes error is mainly caused by the Fairplay DRM protected iTunes movies, which is not allowed to be played on any non-Apple devices, such as Samsung smart TV and LG smart TV. But don't be upset. This article will guide you to remove iTunes movies DRM and show you 5 efficient ways to play iTunes movies on TV. 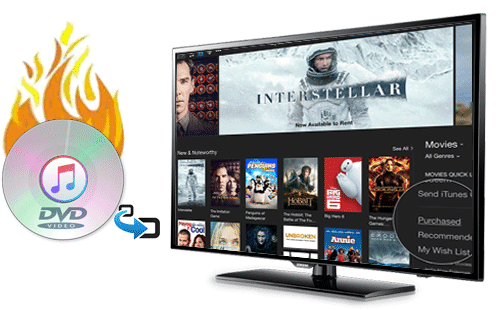 No matter you wanna play your iTunes purchased or rented movies on Samsung smart TV or Sony LG HD TV, removing iTunes movies DRM always comes to be an easier and more flexible solution. And there is nothing better if you can remove iTunes DRM and convert movies to MP4 at a stroke. Fittingly, MacX MediaTrans is such a program, helping you bypass FairPlay DRM Protection, convert iTunes movies to TV and transfer between Mac and iPhone iPad iPod. It finishes iTunes movies DRM decrypting and M4V to MP4 converting during the process of transferring from iPhone iPad to Mac/Windows, or vice versa. And after removing DRM and converting iTunes movies to smart TV supported MP4 format, you can play iTunes movies on TV within HDMI, USB, Apple TV etc. and even you are free to watch iTunes movies on Android as well. In addition, this 3-in-1 iTunes DRM remover is also known as an iTunes alternative, which is intuitive and easy-to-use enough for you to transfer data like photo, music, movies, ebook, voice memo, ringtone etc. between iPhone iPad and Mac/Windows computers. Step 1: Free download the iTunes DRM remover on Mac, or Windows version for your PCs. Then launch it and connect your iPhone to Mac computer with a USB cable. Remember to turn off the iTunes auto sync following the prompts in case of any unexpected data loss. Step 2: Click "Video" icon on the main interface to enter the video transfer window and select the iTunes DRM protected M4V movies, TV shows, or music videos. Or you can tick the white box or just choose "Select All". Step 3: Press "Export" button and your iTunes DRM movies will be automatically decrypted and converted to MP4 video without DRM protection during the process of transferring iTunes purchases from iPhone to Mac/Windows computer. After you unblock iTunes DRM, you can play iTunes movies on TV without hassle. Now here we go for the specific ways. If your television set has a USB port, you may be able to use it to watch iTunes best Hollywood movies, top Oscar winning movies or some other that you have converted from M4V to MP4 on your computer. It is true that you can transfer your converted iTunes movies and TV shows to your USB flash drive as well. 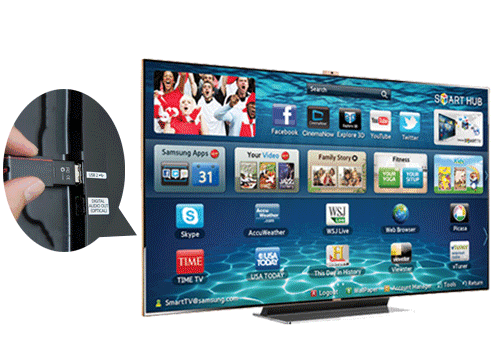 The only thing you need to do is to connect the USB port with Samsung/LG/Sony Smart TV to sync iTunes movies to it. 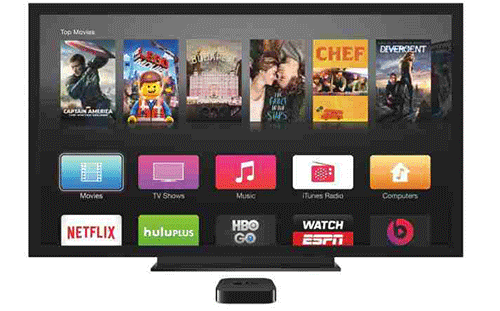 Now you are free to watch any iTunes movie on Smart TV. Firstly, plug USB drive to your computer. Then copy those DRM-free iTunes video files to the USB from your computer. You can also connect the USB flash drive to the computer and set it as the output folder for the converted iTunes movies before conversion. Plug the USB stick to the smart TV's USB port and then you can choose whatever iTunes movie you just converted with the above DRM converter Mac/Windows to play on your smart TV from the USB drive. Here's a list of new movies on iTunes for you to watch on TV. Airplay is one of the most popular and efficient way to watch iTunes movies on Apple TV. If you have an iPhone or iPad, streaming iTunes movies to Apple TV has never to be easier since you can use AirPlay to display video from your Mac on an HDTV. Once you're playing movies on your iPhone iPad, just tap the "Airplay" button to stream iTunes movies to watch on Apple TV. But what if you have no iPhone or iPad? 5KPlayer, a media player with built-in Airplay function works as well. 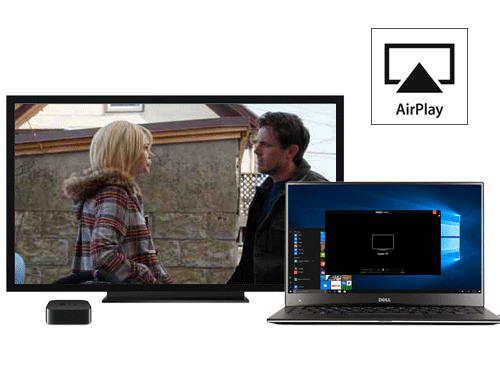 Based on AirPlay technology, this free media player allows users to easily stream film and video from Mac/Windows to Apple TV, and enjoy the extreme audio and visual entertainment, at 1080P, 4K and even 5K resolution. Step 1: Download 5KPlayer on your Mac, or Windows version on Windows PCs then launch it. Step 2: To stream iTunes movie to Apple TV, click AirPlay button on the top right corner on the interface and you can see a list of airplay video receivers. Select Apple TV. The AirPlay button will go red if it is enabled. Step 3: Add your converted MP4 iTunes movies you want to stream from Mac to Apple TV. Streaming iTunes movies to smart TV through HDMI cable works only for the users who have a new Mac laptop, which has a HDMI connection. As you may know, your free full movies downloads from iTunes can be authorized on up to 5 devices only. If your Mac laptop is authorized to play the iTunes movies, you can connect your Mac and smart TV via HDMI cable. And you can watch iTunes movies on TV and Mac computer simultaneously. Another way to play iTunes movies on TV at your leisure is to get connected to Apple TV. You can play movies on Apple TV once you connect from your iTunes library to the TV. By choosing to sync iTunes movies from iTunes library to Apple TV, you will have all the selected movies at your disposal to connect to a larger screen which is the basic discrepancy that one faces on iPods and iPads, even though they have superior video output. Step 1. Launch Apple TV and choose Movies > Purchased (or Rental) on the Apple TV main menu. Burning videos to a DVD is the best possible way in which one can access any movie from any source. Though iTunes movies are trapped in Fairplay DRM protection, it is entirely feasible to burn them to DVDs after you convert iTunes movies to TV MP4 with iTunes video converter. Step 1: Copy all the data you want to burn into a folder. For example, copy the converted iTunes movies to a folder, no matter where it located. Step 2: Right click on the folder and choose Burn "Folder Name" to Disc. If you don't already have a disc in the optical drive, you'll get a message asking you to insert one. Step 3: You can give your disc a name and choose the burning speed, which should automatically be set to the max speed. Step 4: Click Burn and the CD or DVD will begin to be burned. For data discs, it's as simple as that. Well, as you can see, you need to get the iTunes DRM-free and convert iTunes movies to TV supported formats like MP4 etc. unless you have a high budget to purchase an Apple TV, or iPhone iPad for iTunes movies playback on HD TV. No matter you'd like play iTunes movies on TV via USB, HDMI, DVD, or even uploading to meida server like Plex, removing the iTunes movies DRM is always prior to everything. So make the best of the above mentioned MacX MediaTrans to bypass the stubborn iTunes DRM and then enjoy your iTunes movies freely on TV. MacX MediaTrans - Best iTunes DRM removal tool to remove iTunes M4V DRM, convert M4V to MP4 and transfer iTunes movies to Mac/Windows laptops for finally playing iTunes movies on TV without any hassle.